The Bundestag (German pronunciation: [ˈbʊndəstaːk], "Federal Diet") is the German federal parliament. It can be compared to the chamber of deputies along the lines of the United States House of Representatives or the House of Commons of the United Kingdom. Through the Bundesrat, a separate institution, the individual states of Germany participate in legislation similar to a second house in a bicameral parliament. The Bundestag was established by article III of the Basic Law for the Federal Republic of Germany (Constitution) in 1949 as one of the legislative bodies of Germany and thus the historical successor to the earlier Reichstag. Since 1999 it has met in the Reichstag Building in Berlin. Wolfgang Schäuble is the current President of the Bundestag. Members of the Bundestag (Mitglieder des Bundestages) are usually elected every four years by all adult German citizens in a mixed system of constituency voting and list voting. The constitutional minimum number of seats is 598; with overhang and leveling seats there are currently 709 seats. The Election Day can be called earlier than four years after the last if the Federal Chancellor (Bundeskanzler) loses a vote of confidence and asks the Federal President (Bundespräsident) to dissolve the Bundestag in order to hold new general elections. In the 19th century, the name Bundestag was the unofficial designation for the assembly of the sovereigns and mayors of the Monarchies and Free Cities which formed the German Confederation (1815–1866). Its seat was in the Free City of Frankfurt on the Main. With the dissolution of the German Confederation in 1866 and the founding of the German Empire (Deutsches Reich) in 1871, the Reichstag was established as the German parliament in Berlin, which was the capital of the then Kingdom of Prussia (the largest and most influential state in both the Confederation and the empire). Two decades later, the current parliament building was erected. The Reichstag delegates were elected by direct and equal male suffrage (and not the three-class electoral system prevailing in Prussia until 1918). The Reichstag did not participate in the appointment of the Chancellor until the parliamentary reforms of October 1918. After the Revolution of November 1918 and the establishment of the Weimar Constitution, women were given the right to vote for (and serve in) the Reichstag, and the parliament could use the no-confidence vote to force the chancellor or any cabinet member to resign. In March 1933, one month after the Reichstag fire, the then President of the Weimar Republic, Paul von Hindenburg, a retired war hero, gave Adolf Hitler ultimate power through the Decree for the Protection of People and State and the Enabling Act of 1933, although Hitler remained at the post of Federal Government Chancellor (though he called himself the Führer). After this, the Reichstag met only rarely, usually at the Krolloper (Kroll Opera House) to unanimously rubber-stamp the decisions of the government. It last convened on 26 April 1942. With the new Constitution of 1949, the Bundestag was established as the new West German parliament. Because West Berlin was not officially under the jurisdiction of the Constitution, a legacy of the Cold War, the Bundestag met in Bonn in several different buildings, including (provisionally) a former waterworks facility. In addition, owing to the city's legal status, citizens of West Berlin were unable to vote in elections to the Bundestag, and were instead represented by 22 non-voting delegates chosen by the House of Representatives, the city's legislature. The Bundeshaus in Bonn is the former parliament building of Germany. The sessions of the German Bundestag were held there from 1949 until its move to Berlin in 1999. Today it houses the International Congress Centre Bundeshaus Bonn and in the northern areas the branch office of the Bundesrat ("Federal Council"), which represents the Länder – the federated states). The southern areas became part of German offices for the United Nations in 2008. Since April 19, 1999, the German parliament has again assembled in Berlin in its original Reichstag building, which was built in 1888 based on the plans of German architect Paul Wallot and underwent a significant renovation under the lead of British architect Lord Norman Foster. Parliamentary committees and subcommittees, public hearings and parliamentary group meetings take place in three auxiliary buildings, which surround the Reichstag building: the Jakob-Kaiser-Haus, Paul-Löbe-Haus and Marie-Elisabeth-Lüders-Haus. The Bundestag is elected for four years, and new elections must be held between 46 and 48 months after the beginning of its electoral term, unless the Bundestag is dissolved prematurely. It's term ends when the next Bundestag convenes, which must occur within 30 days of the election. Prior to 1976, there could be a period where one Bundestag had been dissolved and the next Bundestag could not be convened; during this period, the rights of the Bundestag were exercised by a so-called "Permanent Committee". All candidates must be at least eighteen years old; there are no term limits. The election uses the MMP electoral system. In addition, the Bundestag has a minimum threshold of either 5% of the national party vote or three (directly elected) constituency representatives for a party to gain additional representation through the system of proportional representation. Thus, small minority parties cannot easily enter the Bundestag and prevent the formation of stable majority governments as they could under the Weimar constitution. The most recent election, the German federal election, 2017, was held on 24 September 2017. In addition to this, there are certain circumstances in which some candidates win what are known as overhang seats when the seats are being distributed. If a party has gained more direct mandates in a Land than it is entitled to according to the results of the second vote, it does not forfeit these mandates because all directly elected candidates are guaranteed a seat in the Bundestag. The other parties are then compensated by getting additional seats as well, the balance seats, so proportionality is preserved. The last Federal elections were held on Sunday, 24 September 2017, to elect the members of the 19th Bundestag. The election saw the CDU/CSU win 33% of the vote, a drop of more than 8% and its lowest share of the vote since 1949, while the SPD achieved its worst result since the Second World War with just 20% of the vote. Alternative for Germany (AfD)—which was previously unrepresented in the Bundestag—became the third party in the Bundestag with 12.6% of the vote and a plurality of the vote in Saxony. No party won an outright majority in any state, including Bavaria, where the CSU often wins majorities and won a majority of the vote in 2013. The most important organisational structures within the Bundestag are parliamentary groups (Fraktionen; sing. Fraktion), which are traditionally formed by political parties who win at least 5% of the "second vote." The CDU and CSU have always formed a single united Fraktion. The size of a party's Fraktion determines the extent of its representation on legislative committees, the time slots allotted for speaking, the number of committee chairs it can hold, and its representation in executive bodies of the Bundestag. The Fraktionen, not the members, receive the bulk of government funding for legislative and administrative activities. The leadership of each Fraktion consists of a parliamentary party leader, several deputy leaders, and an executive committee. The leadership's major responsibilities are to represent the Fraktion, enforce party discipline and orchestrate the party's parliamentary activities. The members of each Fraktion are distributed among working groups focused on specific policy-related topics such as social policy, economics, and foreign policy. The Fraktion meets every Tuesday afternoon in the weeks in which the Bundestag is in session to consider legislation before the Bundestag and formulate the party's position on it. Parties that do not cross the 5% threshold but win at least three seats by direct elections (i.e. which have at least three MPs representing a constituency seat) can be granted the status of a group in the Bundestag. This applied to the Party of Democratic Socialism (PDS) from 1990-1998. This status entails some privileges which are in general less than those of a Fraktion. In the current Bundestag, there are no such groups (the PDS had only two constituency MPs in parliament until 2005 and could thus not even considered a group anymore; the party—now The Left—has held full Fraktion status in the Bundestag since 2005). Most of the legislative work in the Bundestag is the product of standing committees, which exist largely unchanged throughout one legislative period. The number of committees approximates the number of federal ministries, and the titles of each are roughly similar (e.g., defense, agriculture, and labor). There are, as of the current eighteenth Bundestag, 23 standing committees. The distribution of committee chairs and the membership of each committee reflect the relative strength of the various Parliamentary groups in the chamber. 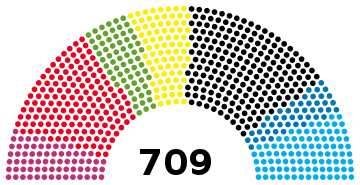 In the current eighteenth Bundestag, the CDU/CSU chaired twelve committees, the SPD seven, The Left (Die Linke) two, and the Greens (Bündnis 90/Die Grünen), two. Members of the opposition party can chair a significant number of standing committees (e.g. The budget committee is always chaired by the biggest opposition party). These committees have either a small staff or no staff at all. As is the case with some other parliaments, the Bundestag is subject to the principle of discontinuation, meaning that a newly elected Bundestag is legally regarded to be a body and entity completely different from the previous Bundestag. This leads to the result, that any motion, application or action submitted to the previous Bundestag, e.g. a bill referred to the Bundestag by the Federal Government, is regarded as void by non-decision (German terminology: "Die Sache fällt der Diskontinuität anheim"). Thus any bill that has not been decided upon by the beginning of the new electoral period must be brought up by the government again if it aims to uphold the motion, this procedure in effect delaying the passage of the bill. Furthermore, any newly elected Bundestag will have to freshly decide on the rules of procedure (Geschäftsordnung), which is done by a formal decision of taking over such rules from the preceding Bundestag by reference. ^ a b The Christian Democratic Union and the Christian Social Union of Bavaria call themselves sister parties. They do not compete against each other in the same states and they form one group within the Bundestag. ^ Grundgesetz für die Bundesrepublik Deutschland (PDF) (23.12.2014 ed.). Bonn: Parlamentarischer Rat. 8 May 1949. Retrieved 19 June 2016. ^ Trenel, M. (2007). "Öffentliche Petitionen beim deutschen Bundestag - erste Ergebnisse der Evaluation des Modellversuchs = An Evaluation Study of Public Petitions at the German Parliament" (PDF). TAB Brief Nr 32. Deutscher Bundestag. Archived from the original (PDF) on 16 March 2009. Retrieved 16 June 2009. ^ "Basic Law, Article 39: Electoral term – Convening". Retrieved 29 September 2017. ^ Schäfer, Friedrich (2013). Der Bundestag: Eine Darstellung seiner Aufgaben und seiner Arbeitsweise [The Bundestag: Its tasks and procedures] (in German). VS Verlag für Sozialwissenschaften. p. 28. ISBN 9783322836434. ^ "Text des Bundeswahlgesetz (BWahlG)". gesetz-im-internet.de. Retrieved 19 June 2016. ^ "Press Release: Verkürzte Fristen zur vorgezogenen Neuwahl des Deutschen Bundestages". www.bundeswahlleiter.de. Bundeswahlleiter = Federal Director for Elections (Federal Returning Officer). 25 July 2005. Archived from the original on 7 October 2007. Retrieved 20 October 2008. ^ "Stenographischer Bericht der 187. Sitzung des 15. Deutschen Bundestages am 28. September 2005 = Stenographic report of the 187th session of the 15th Deutscher Bundestag on 2005-09-28" (PDF). dip21.bundestag.de. Deutscher Bundestag. 28 September 2005. Retrieved 20 October 2008. ^ "Stenographischer Bericht der 1. Sitzung des 16. Deutschen Bundestages am 18. Oktober 2005 = Stenographic report of the 1st session of the 16th Deutscher Bundestag on 2005-10-18" (PDF). dip21.bundestag.de. Deutscher Bundestag. 18 October 2005. Retrieved 20 October 2008. Federal elections were held in Germany on 18 September 2005 to elect the members of the 16th Bundestag. This became necessary after a motion of confidence in Chancellor Gerhard Schröder failed on 1 July. Following the defeat of Schröder's Social Democratic Party (SPD) in a state election, Schröder asked his supporters to abstain from the Bundestag motion, knowing the motion would fail and thus triggering an early federal election. Exit polls showed clearly that neither coalition group had won a majority of seats in the Bundestag, leading to a hung parliament situation. Both parties lost seats compared to 2002, as did the Greens, while only the Left Party (a partial successor of the Party of Democratic Socialism led by Gregor Gysi and former SPD chairman Oskar Lafontaine) made significant gains. Both Schröder and Merkel claimed victory, but the formation of a new government required careful negotiations. On 10 October 2005, officials from the SPD and the CDU/CSU indicated that negotiations between the two had concluded successfully and that the participating parties would form a grand coalition with Angela Merkel as Chancellor. When the Bundestag met on 22 November, 397 CDU/CSU and SPD Bundestag members duly voted for Merkel. Federal elections were held on 22 September to elect the members of the 18th Bundestag of Germany. At stake were all 598 seats to the Bundestag, plus 33 overhang seats determined thereafter. The Christian Democratic Union/Christian Social Union (CDU/CSU) of Chancellor Angela Merkel won their best result since 1990, with nearly 42% of the vote and nearly 50% of the seats (five short for an overall majority). However, their coalition partner, the Free Democrats (FDP), failed to meet the 5% vote threshold in what was their worst showing ever in a federal election, thus denying them seats in the Bundestag for the first time in their history. Merkel's party reached a coalition agreement with the then-main opposition party, the Social Democrats (SPD), to form a grand coalition; the third in the country's history since World War II. The SPD leadership conducted a ratification vote by their broader membership before the agreement was made final. Federal elections were held in Germany on 24 September 2017 to elect the members of the 19th Bundestag. At stake were all 598 seats in the Bundestag, as well as 111 overhang and leveling seats determined thereafter. The Christian Democratic Union/Christian Social Union (CDU/CSU), led by Chancellor Angela Merkel, won the highest percentage of the vote with 33%, though suffered a large swing against it of more than 8%. The Social Democratic Party (SPD) achieved its worst result since the Second World War with only 20% of the vote. Alternative for Germany (AfD)—which was previously unrepresented in the Bundestag—became the third party in the Bundestag with 12.6% of the vote, whilst the Free Democrats (FDP) won 10.7% of the vote and returned to the Bundestag after losing all their seats in the 2013 election. It was the first time since 1957 that a party to the right of the CDU/CSU Union gained seats in the Bundestag. The other parties to achieve representation in the Bundestag were the Left and the Greens, who each won close to 9% of the vote. In the 709 member Bundestag, the CDU/CSU won 246 seats (200 CDU and 46 CSU), SPD 153, AfD 94, FDP 80, the Left (Linke) 69, and the Greens 67. A majority is 355. For the second consecutive occasion, the CDU/CSU reached a coalition agreement with the SPD to form a grand coalition, the fourth in post-war German history. The new government took office on 14 March 2018. The agreement came after a failed attempt by the CDU/CSU to enter into a "Jamaica coalition" with the Greens and the Free Democrats, which the latter pulled out of citing irreconcilable differences between the parties on migration and energy policy. Angela Dorothea Merkel (, German: [aŋˈɡeːla ˈmɛɐ̯kl̩]; née Kasner; born 17 July 1954) is a German politician serving as Chancellor of Germany since 2005. She served as the leader of the centre-right Christian Democratic Union (CDU) from 2000 to 2018. Merkel has been widely described as the de facto leader of the European Union, the most powerful woman in the world, and by many commentators as the leader of the Free World.Merkel was born in Hamburg in then-West Germany and moved to East Germany as an infant when her father, a Lutheran clergyman, received a pastorate in Perleberg. She obtained a doctorate in quantum chemistry in 1986 and worked as a research scientist until 1989. Merkel entered politics in the wake of the Revolutions of 1989, and briefly served as a deputy spokesperson for the first democratically elected East German Government headed by Lothar de Maizière in 1990. Following German reunification in 1990, Merkel was elected to the Bundestag for the state of Mecklenburg-Vorpommern, and has been reelected ever since. As the protégée of Chancellor Helmut Kohl, Merkel was appointed as the Federal Minister for Women and Youth in Kohl's government in 1991, and became the Federal Minister for the Environment, Nature Conservation and Nuclear Safety in 1994. After her party lost the federal election in 1998, Merkel was elected Secretary-General of the CDU before becoming the party's first female leader two years later in the aftermath of a donations scandal that toppled Wolfgang Schäuble. Following the 2005 federal election, Merkel was appointed Germany's first female chancellor at the head of a grand coalition consisting of the CDU, its Bavarian sister party the Christian Social Union (CSU), and the Social Democratic Party of Germany (SPD). In the 2009 federal election the CDU obtained the largest share of the vote, and Merkel was able to form a coalition government with the Free Democratic Party (FDP). At the 2013 federal election, Merkel's CDU won a landslide victory with 41.5% of the vote and formed a second grand coalition with the SPD, after the FDP lost all of its representation in the Bundestag. After the 2017 federal election the CDU was again the largest party, and she was reelected to her fourth term on 14 March 2018.In 2007, Merkel was President of the European Council and played a central role in the negotiation of the Treaty of Lisbon and the Berlin Declaration. One of Merkel's consistent priorities has been to strengthen transatlantic economic relations. Merkel played a crucial role in managing the financial crisis at the European and international level, and she has been referred to as "the decider." In domestic policy, health care reform, problems concerning future energy development and more recently her government's approach to the ongoing migrant crisis have been major issues during her Chancellorship. On 26 March 2014, Merkel became the longest-serving incumbent head of government in the European Union and she is currently the senior G7 leader. In October 2018, Merkel announced that she would not seek reelection as leader of the CDU at the party convention in December 2018 and as Chancellor in 2021. The German Bundesrat (literally "Federal Council"; pronounced [ˈbʊndəsʁaːt]) is a legislative body that represents the sixteen Länder (federated states) of Germany at the national level. The Bundesrat meets at the former Prussian House of Lords in Berlin. Its second seat is located in the former West German capital of Bonn. The Bundesrat participates in legislation, alongside the Bundestag, the directly elected representation of the people of Germany, with laws affecting state competences and all constitutional changes requiring the consent of the body. For its similar function, it is sometimes described as an upper house of parliament along the lines of the US Senate, the Canadian Senate or the British House of Lords.Bundesrath (from 1901 on: Bundesrat, according to a general spelling reform) was the name of similar bodies in the North German Confederation (1867) and the German Empire (1871). Its predecessor in the Weimar Republic (1919–1933) was the Reichsrat. Bundestag is a Berlin U-Bahn station located on the U 55. The name of this station was changed in April 2006 from Reichstag to Bundestag after deputations from the Bundestag which sits in the Reichstag building. CDU/CSU, unofficially the Union parties (German: Unionsparteien) or the Union, is the centre-right Christian democratic political alliance of two political parties in Germany, namely the Christian Democratic Union of Germany (CDU) and Christian Social Union in Bavaria (CSU). According to German Federal Electoral Law, members of a parliamentary group which share the same basic political aims must not compete with one another in any federal state. The CSU contests elections only in Bavaria, while the CDU operates in the other 15 states of Germany. The CSU also reflects the particular concerns of the largely rural, Catholic south. While the two Christian Democratic parties are commonly described as sister parties and have been sharing a common parliamentary group in the Bundestag, the CDU/CSU Parliamentary Group in the German Bundestag (German: CDU/CSU-Fraktion im Deutschen Bundestag) since the foundation of the Federal Republic of Germany in 1949, the parties themselves officially remain completely independent with their own leadership and only few issue- or age-based joint organisations, which makes the alliance informal. However, in practice the committees of the parties harmonise their decisions with each other and the leader of one party is usually invited to party conventions of the other party. Both the CDU and CSU are members of the European People's Party and the International Democrat Union. Both parties sit in the European People's Party group in the European Parliament. The CDU and CSU share a common youth organisation, the Youth Union, a common pupil organisation, the Pupil Union of Germany, a common student organisation, the Association of Christian Democratic Students and a common Mittelstand organisation, the Mittelstand and Business association. The Cabinet of Germany (German: Bundeskabinett or Bundesregierung) is the chief executive body of the Federal Republic of Germany. It consists of the Chancellor and the cabinet ministers. The fundamentals of the cabinet's organization as well as the method of its election and appointment as well as the procedure for its dismissal are set down in articles 62 through 69 of the Grundgesetz (the Basic Law). In contrast to the system under the Weimar Republic, the Bundestag may only dismiss the Chancellor with constructive vote of no-confidence (electing a new Chancellor at the same time) and can thereby only choose to dismiss the Chancellor with his or her entire cabinet and not simply individual ministers. These procedures and mechanisms were put in place by the authors of the Basic Law to both prevent another dictatorship and to ensure that there will not be a political vacuum left by the removal of Chancellor through a vote of confidence and the failure to elect a new one in his or her place, as had happened during the Weimar period with the Reichstag removing Chancellors but failing to agree on the election of a new one. If the Chancellor loses a simple confidence motion (without the election of a new Chancellor by the Bundestag), this does not force him or her out of office, but allows the Chancellor, if he wishes to do so, to ask the President of Germany for the dissolution of the Bundestag, triggering a snap election within 60 days (this happened in 1972, 1983 and 2005), or to ask the President to declare a legislative state of emergency, which allows the cabinet to use a simplified legislative procedure, in which bills proposed by the cabinet only need the consent of the Bundesrat (as yet, this has never been applied). The President is however not bound to follow the Chancellor's request in both cases. The Chancellor and the other members of the cabinet are allowed to be also members of the Bundestag, and most of them actually are. Elections in Germany include elections to the Bundestag (Germany's federal parliament), the Landtags of the various states, and local elections. Several articles in several parts of the Basic Law for the Federal Republic of Germany govern elections and establish constitutional requirements such as the secret ballot, and requirement that all elections be conducted in a free and fair manner. The Basic Law also requires that the federal legislature enact detailed federal laws to govern elections; electoral law(s). One such article is Article 38 which is regarding the election of deputies in the federal Bundestag. Article 38.2 of the Basic Law establishes universal suffrage: "Any person who has attained the age of eighteen shall be entitled to vote; any person who has attained the age of majority may be elected." German federal elections are for all members of the Bundestag, which in turn determines who is the Chancellor of Germany. Federal elections were held in 2009, 2013 and in 2017. Father of the House is a title that has been traditionally bestowed, unofficially, on certain members of some legislatures, most notably the House of Commons in the United Kingdom. In some legislatures the title refers to the longest continuously-serving member, while in others it refers to the oldest member. Recently, the title Mother of the House or Mother of Parliament has also been used, although the usage varies between countries; it is simply the female alternative to Father of the House, being applied when the relevant member is a woman. Kurt Georg Kiesinger (German: [ˈkʊɐ̯t ˈɡeːɔɐ̯k ˈkiːzɪŋɐ]; 6 April 1904 – 9 March 1988) was a German politician who served as Chancellor of Germany (West Germany) from 1 December 1966 to 21 October 1969. Before he became Chancellor he served as Minister President of Baden-Württemberg from 1958 to 1966 and as President of the Federal Council from 1962 to 1963. He was Chairman of the Christian Democratic Union from 1967 to 1971. The President of Germany, officially the Federal President of the Federal Republic of Germany (German: Bundespräsident der Bundesrepublik Deutschland), is the head of state of Germany. Germany has a parliamentary system of government in which the chancellor is the nation's leading political figure and de facto chief executive. The president has a mainly ceremonial role, but he can give direction to general political and societal debates and has some important "reserve powers" in case of political instability (such as those provided for by Article 81 of the Basic Law). The German presidents have wide discretion about how they exercise their official duties.Under Article 59 (1) of the Basic Law (German Constitution), the president represents the Federal Republic of Germany in matters of international law, concludes treaties with foreign states on its behalf and accredits diplomats. Furthermore, all federal laws must be signed by the president before they can come into effect, but usually they only veto a law if they believe it to violate the constitution. The president, by their actions and public appearances, represents the state itself, its existence, legitimacy, and unity. The president's role is integrative and includes the control function of upholding the law and the constitution. It is a matter of political tradition – not legal restrictions – that the president generally does not comment routinely on issues in the news, particularly when there is some controversy among the political parties. This distance from day-to-day politics and daily governmental issues allows the president to be a source of clarification, to influence public debate, voice criticism, offer suggestions and make proposals. In order to exercise this power, they traditionally act above party politics.The 12th and current officeholder is Frank-Walter Steinmeier who was elected on 12 February 2017 and started his first five-year term on 19 March 2017. The President of the Bundestag (German: Präsident des Deutschen Bundestages or Bundestagspräsident) presides over the sessions of the Bundestag, the federal parliament of Germany, with functions similar to that of a speaker in other countries. In the German order of precedence, his office is ranked second after the President and before the Chancellor. The 13th and current President of the Bundestag is Wolfgang Schäuble, since October 24, 2017. The Reichstag (German: Reichstagsgebäude pronounced [ˈʁaɪçstaːksgəˈbɔʏdə]; officially: Deutscher Bundestag – Plenarbereich Reichstagsgebäude pronounced [ ˈdɔʏtʃɐ ˈbʊndəsˌtaːk ˈpleːnaːrbəraɪç ˈʁaɪçstaːksgəˈbɔʏdə]) is a historic edifice in Berlin, Germany, constructed to house the Imperial Diet (German: Reichstag) of the German Empire. It was opened in 1894 and housed the Diet until 1933, when it was severely damaged after being set on fire. After World War II, the building fell into disuse; the parliament of the German Democratic Republic (the Volkskammer) met in the Palast der Republik in East Berlin, while the parliament of the Federal Republic of Germany (the Bundestag) met in the Bundeshaus in Bonn. The term Reichstag, when used to connote a diet, dates back to the Holy Roman Empire. The building was built for the Diet of the German Empire, which was succeeded by the Reichstag of the Weimar Republic. The latter would become the Reichstag of Nazi Germany, which left the building (and ceased to act as a parliament) after the 1933 fire and never returned, using the Kroll Opera House instead; the term Reichstag has not been used by German parliaments since World War II. In today's usage, the word Reichstag (Imperial Diet Building) refers mainly to the building, while Bundestag (Federal Diet) refers to the institution. The Left (German: Die Linke), also commonly referred to as the Left Party (German: die Linkspartei, pronounced [diː ˈlɪŋkspaʁˌtaɪ̯] (listen)), is a democratic socialist political party in Germany. It is considered to be left-wing populist by some researchers. The party was founded in 2007 as the result of the merger of the Party of Democratic Socialism (PDS) and the Electoral Alternative for Labour and Social Justice (WASG). Through the PDS, the party is the direct descendant of the ruling party of the former East Germany (GDR), the Socialist Unity Party of Germany (SED).Since mid-2012, its co-chairs have been Katja Kipping and Bernd Riexinger. In the Bundestag the party won 64 out of 630 seats after polling 8.6% of the vote in the 2013 federal elections and, after the Social Democrats and the CDU/CSU formed a grand coalition, became leader of the opposition. In the 2017 elections, the party acquired 69 out of 709 seats after receiving 9.2% of the vote.. Its parliamentary group is the fifth largest among the six groups in the German Bundestag, ahead of the Greens. The Left is a founding member of the Party of the European Left, and is the largest party in the European United Left–Nordic Green Left (GUE/NGL) group in the European Parliament. The party is the most left-wing party of the six represented in the Bundestag, and has been called far-left by some news outlets, but according to the German Federal Office for the Protection of the Constitution (Verfassungschutz), the party as such is not to be regarded as extremely left or a threat to democracy. However, it does monitor some of its internal factions, such as Socialist Left, as do some states' similar authorities, on account of suspected extremist tendencies.According to official party figures, the Left Party had 63,784 registered members as of December 2013, making it the fifth-largest party in Germany.The party participates in governments in the states of Brandenburg, as junior partner to the Social Democratic Party of Germany (SPD); Thuringia with the SPD and The Greens in a three-party coalition with The Left parliamentarian Bodo Ramelow serving as Minister-President; and Berlin with the SPD and Greens in a three-party coalition, led by Michael Müller of the SPD.